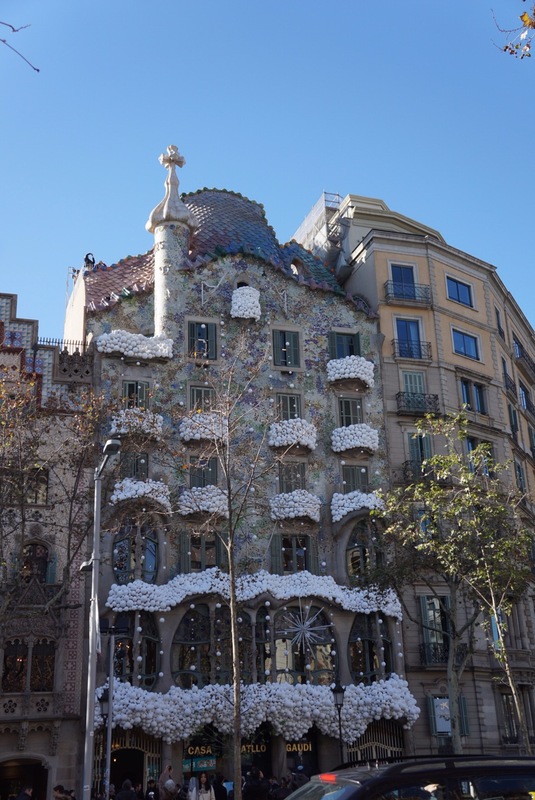 Barcelona for Christmas time, we decided, and booked six nights here to have a more relaxed time of it. The neighborhood here we decided on was Gracia, an area to the North side of Barcelona, again not in the tourist scrum, more residential but still lively. It turned out to be perfect for us, with vibrant streets and lots of families around. 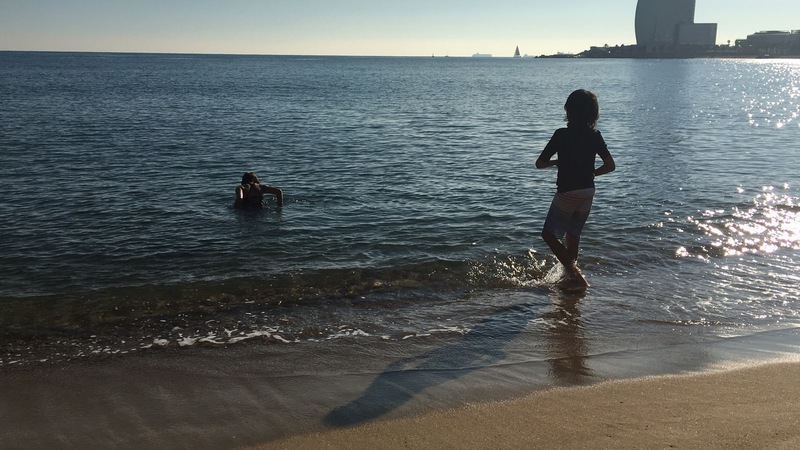 We went to the beach the first day, first walking down La Rambla, the wide boulevard that bisects Barcelona. Ringed with touts selling all sorts of cheap wares and filled with selfie-stick wielding tourists, we escaped as quickly as we could. Finding the ocean, we left the kids at the seaside while Eric and I walked fifty yards away to a boardwalk bar, sipping a beer while the kids became thoroughly covered in sand. 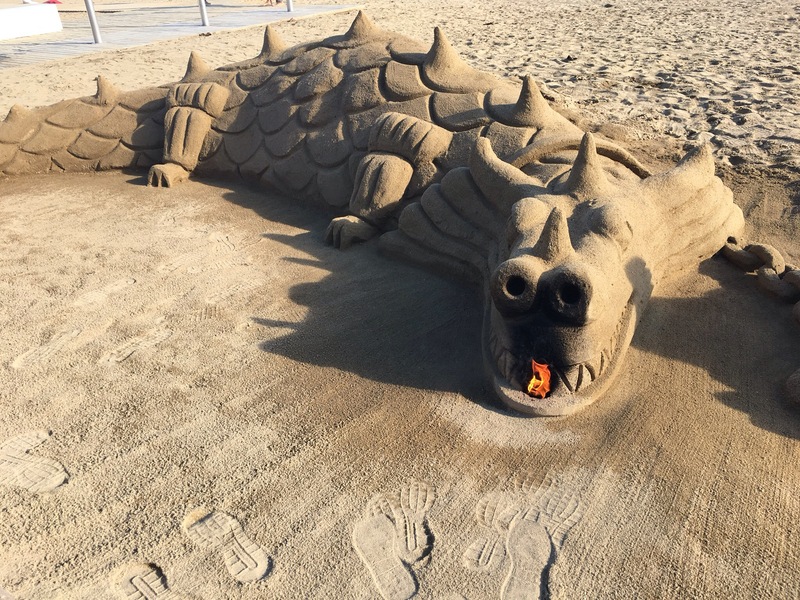 Creative sand artists line the boardwalk with their creations, with boxes for offerings set out in front. On the way home, we strolled through small streets of the old city and eventually ended up back home. We took a walking architecture tour the following day, overall underwhelming from a tour standpoint, but still with some interesting tidbits to be gained. 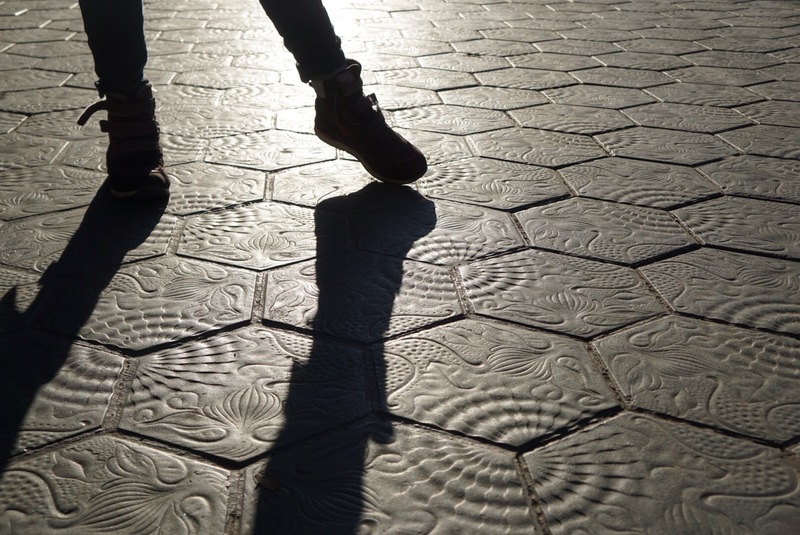 As Eric describes in his post, Barcelona city planning is such that the buildings are laid out on a grid and the facades are cut across corners so that the intersections form somewhat of a diamond or octagonal shape when viewed from above, opening up the city as a whole and letting more light in. In the courtyards of the city blocks are small parks – these had been filled in with warehouses, but as these fall into disuse they are dismantled and the space opened for public use. 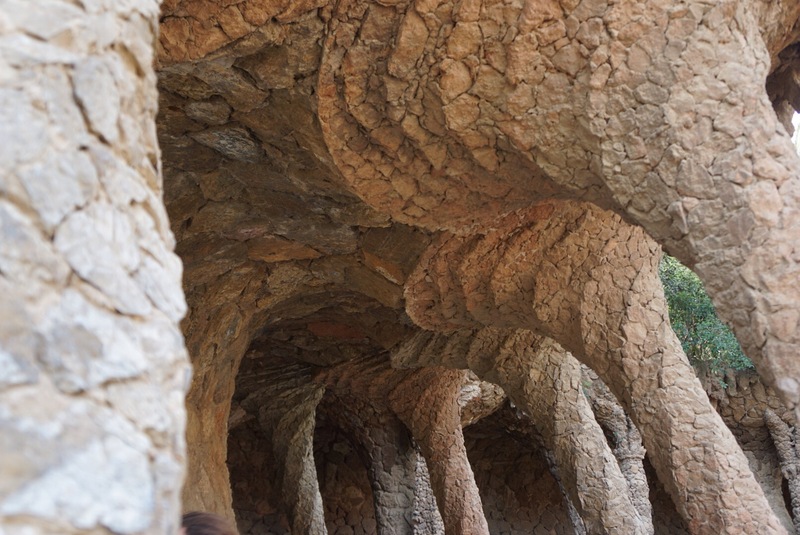 Antoni Gaudi was a Spanish architect who was known for his somewhat outlandish styles, but more so for how he used nature as an inspiration for his buildings. 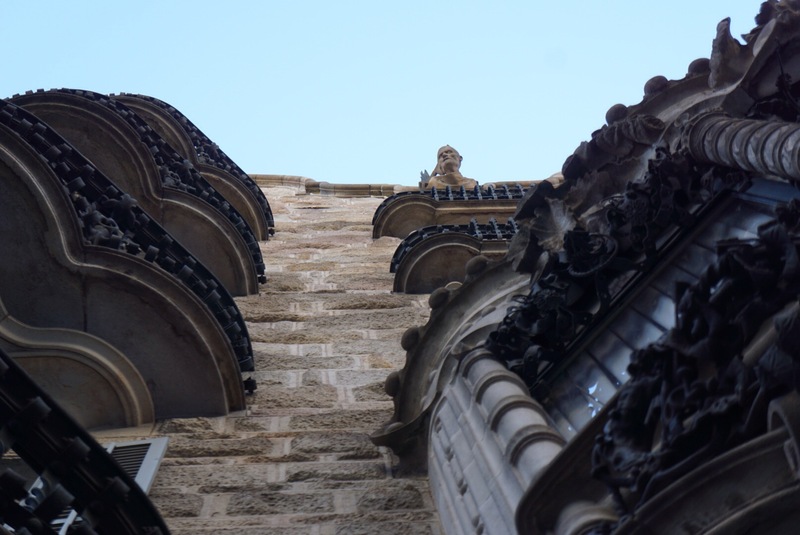 Using catenary arches to support the weight of large buildings was revolutionary, instead of relying on external supporting buttresses as had been done in the past. 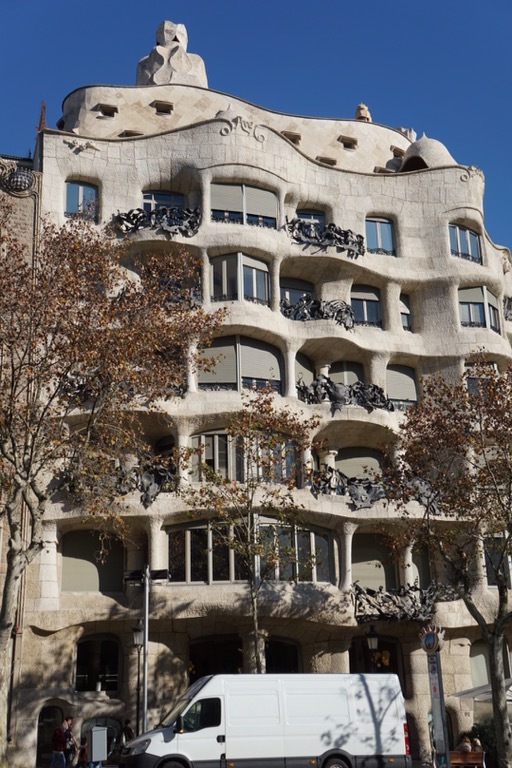 Here you can see the undulating forms of his buildings, in contrast to the straight lines that had been done previously. The roof of the building follows these waved lines in arcing forms. 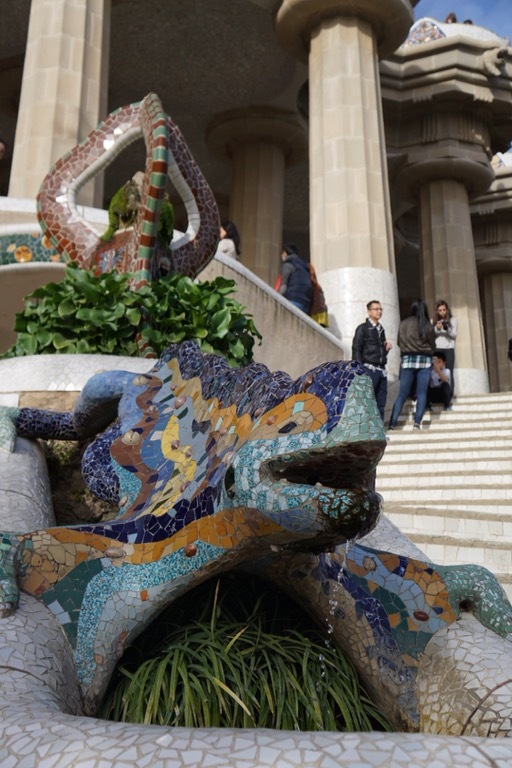 According to our guide, and somewhat unsurprisingly, Gaudi was hated by his contemporaries. After the tour, a lunch of tapas was in order and Cerveseria Catalan did not disappoint. 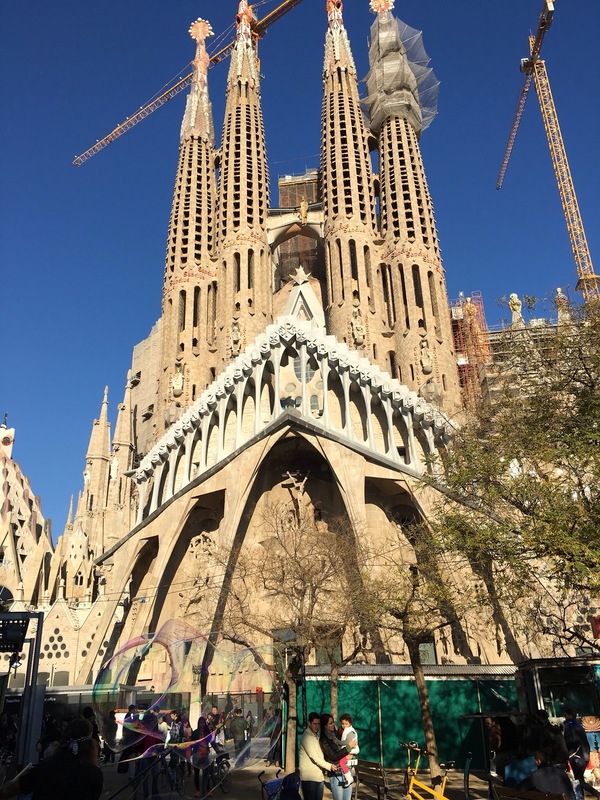 We decided to make a Gaudi day of it and headed to the Sagrada Familia basilica after this, Gaudi’s last civic project before getting run over by a tram at the age of 72. I didn’t really know what to expect, the outside is a bizarre mishmash of styles and scaffolding. It’s now predicted to be completed by 2026, but my guess is that people doubt it will ever be finished. Once you step inside, however, the effect is magnificent. 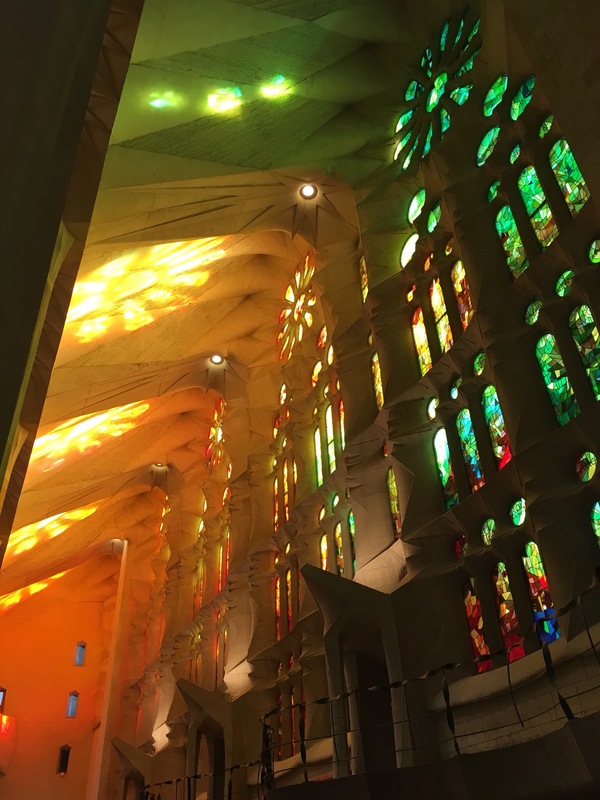 An open space formed by white catenary arches is surrounded by stained glass windows of deepest rainbow colors. You feel as if you’ve wandered into a fairyland forest and the effect is mystical. 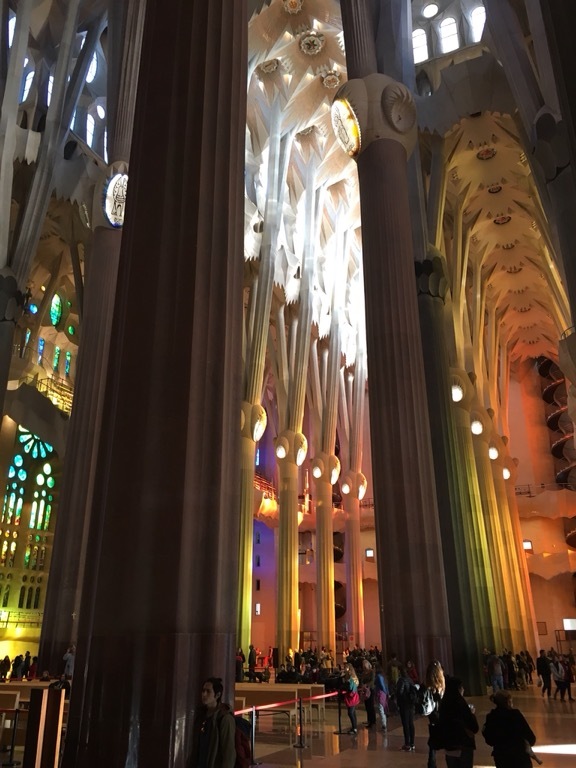 The low afternoon light streamed in and threw colored reflections throughout the cathedral. 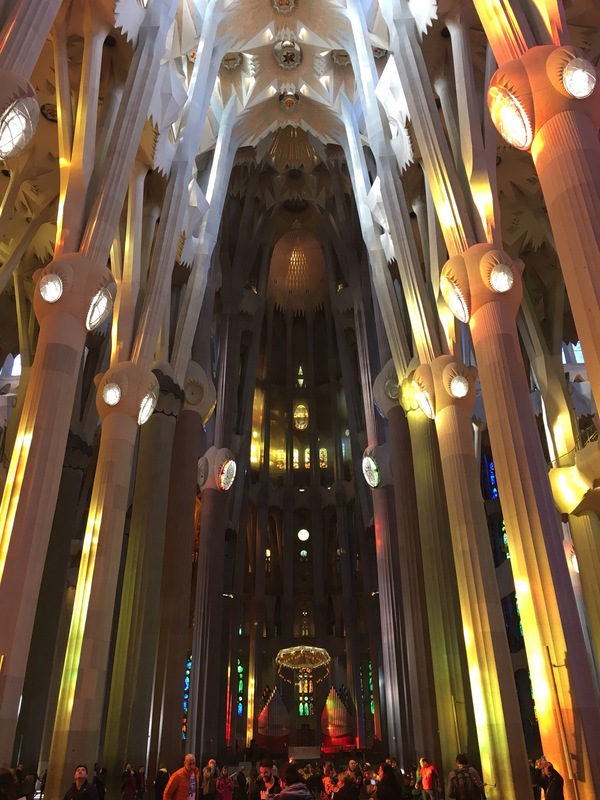 Other than the natural decorations from the light, there was little else in the main room to show power and wealth, unlike the other cathedrals we’ve witnessed so far, and as a result felt truly holy. Interesting that the most religious space I feel I’ve been in is the one that reflects nature as it is, instead of the creations of Man at their most ornate. 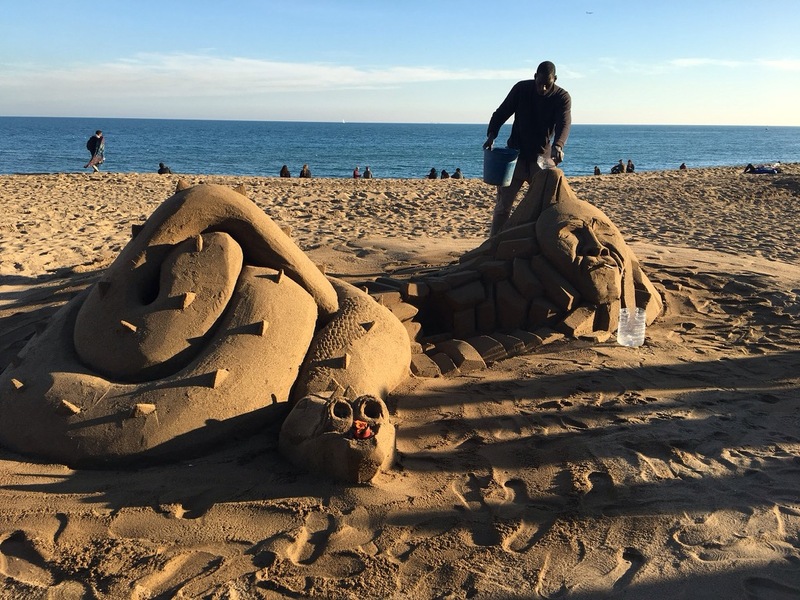 The next day was Christmas Eve, and the girl was clamoring to go back to the beach, so we made that our plan. 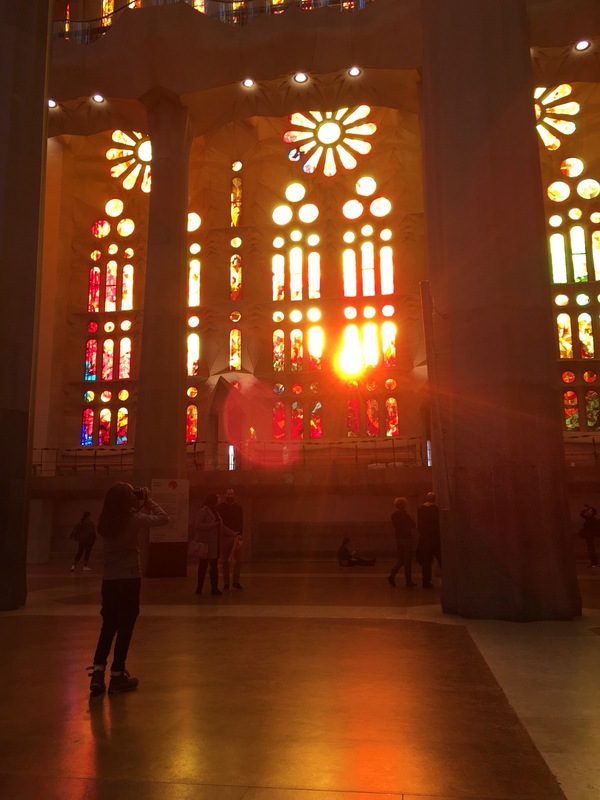 I know that it means we skipped more sightseeing in Barcelona, and the list of things we didn’t really get to see is long, but sometimes everyone has more fun if you just relax and don’t make it about having to “see” everything. Despite the water temperature being 60 degrees, the girl was undeterred and went for a swim, harkening back to her past life as a polar bear. 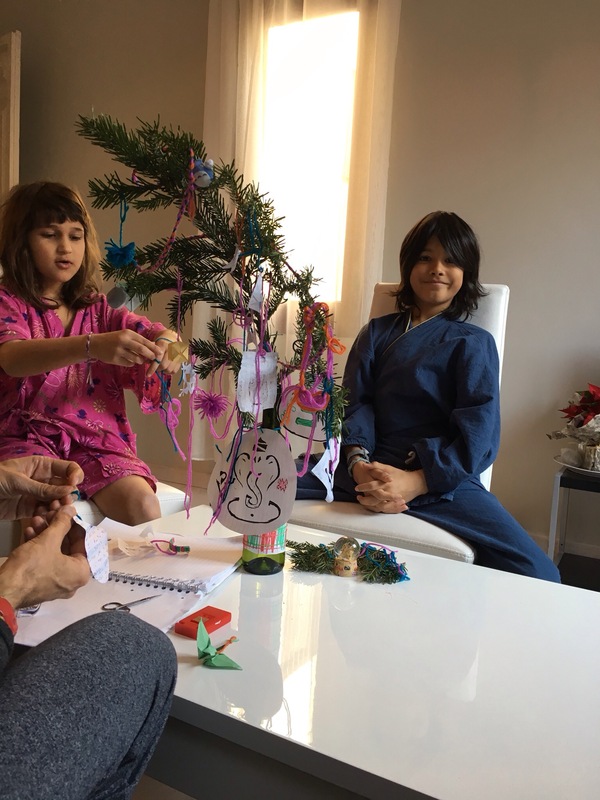 The kids had found a discarded pine tree branch in a pile near the Sagrada Familia, and spent the morning making paper and string ornaments to decorate it. We played Christmas music on my phone and finally felt like we were getting into the spirit a bit more. I haven’t been homesick much on this trip, but this was a harder time. For the last eleven or twelve Christmases, my sister has flown out to Denver for the holiday. The last few years have included my sister’s husband and his sister as well, so the group has happily grown. We make pierogies together, try to go out for a trivia night, once went to a hockey game (my first!) and always go skiing on Christmas day before coming home, taking showers and opening presents in our pajamas. We listen to Christmas music and get our tree the day after Thanksgiving, put up a sparkly wreath, and decorate together. I look forward to it all year, and I know Sapana does too. This year all of us felt wistful at missing a home Christmas and our traditions that usually go with it. A bit late but we managed a little tree, sure. Pierogies too, then, must still be part of the menu. The ingredients weren’t particularly difficult to find, though a rolling pin wasn’t available at the apartment. I continued my series of improvisational cooking by using an unopened wine bottle and it did a serviceable job. Santa managed to find us and brought a small bag of candies for the kids, and Eric and I found them each a present too. 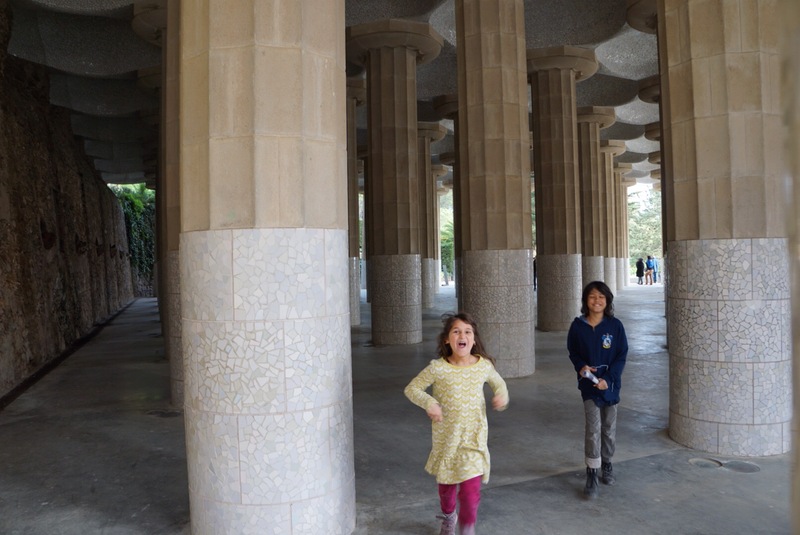 We went out to Park Guell for our last day of Gaudi. Initially conceived as a high-end housing development, it never took off as a residential area. 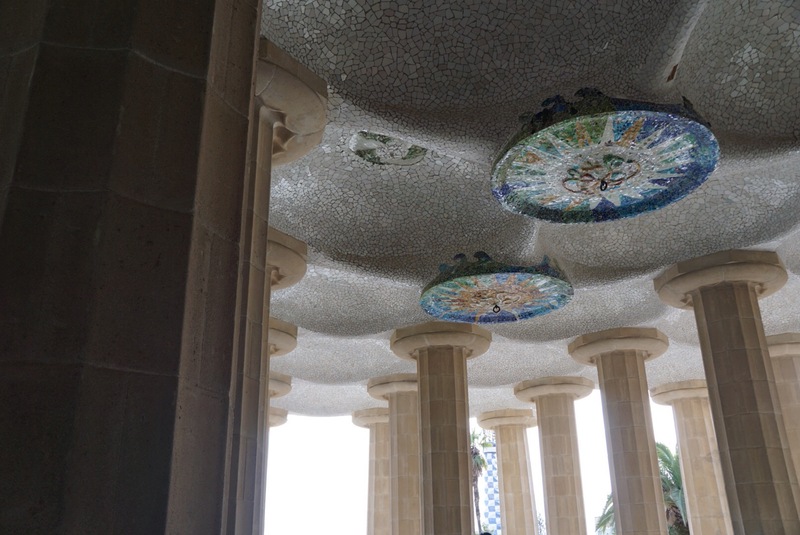 The park features several Gaudi designed elements in a large hillside pavillion leading down to two houses at the base, again in his nature inspired style. Among the columns we played hide and seek, and I must say I did quite well at this. 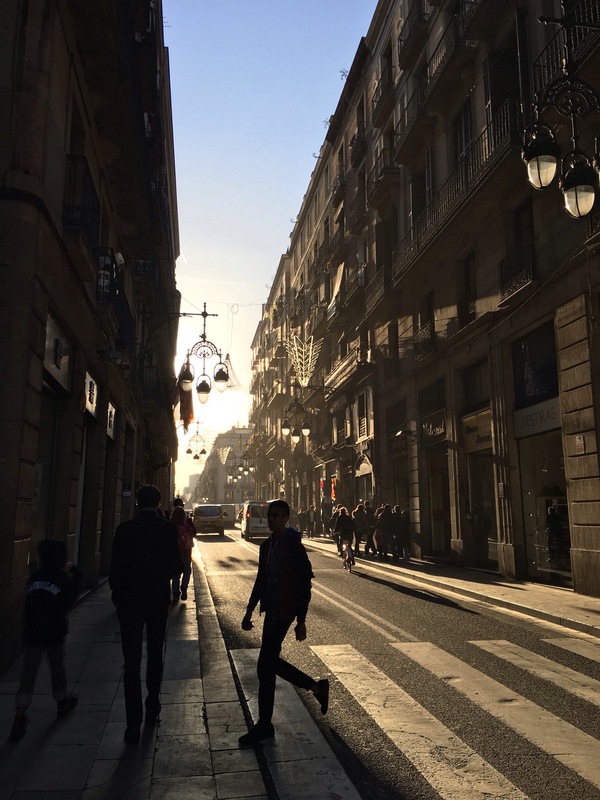 A lovely walk around in the sun, then back home to eat our pierogies, open the wine bottle rolling pin, and hang out before the next day took us to Madrid. it is mindblowing. Something you should definitely see once your life!